This was a big week in the trial against Cecily McMillan. You may have heard about this case before: A cop grabbed the Occupier’s breast hard enough to leave a hand print and then shoved her strongly enough to leave her in a seizure for which she would be hospitalized. And she, not the police officer, is the one on trial. This morning, NYPD officer Grantley Bovell wrapped up his week-long testimony against McMillan. McMillan, now 25, an Occupy Wall Street activist committed to non-violence, is on trial for assaulting Bovell on March 17, 2012 as he and other police forced protesters out of the square. Bovell and the prosecution consider the officer to be the victim and McMillan the aggressor: according to their version, McMillan elbowed Bovell near the eye, causing the officer pain and swelling. McMillan claims she did indeed elbow Bovell, but as a reflex after he grabbed her right breast and lifted her off the ground. Over the course of his testimony this week, Bovell revealed that though he couldn’t recall several important details he was positive McMillan was faking her seizure. 1. A video taken by bystanders demonstrates Cecily convulsing on the ground. You can see her seizing at 7:10 in the video below. 2. A photo taken when McMillan was finally allowed to go to the hospital reveals several bruises, including a hand-shaped one on her right breast. McMillan, a veteran of the anti–Scott Walker protests in Wisconsin, was a dedicated pacifist; in Dissent, her masters thesis adviser Maurice Isserman writes about the “many and long discussions Cecily and I have had about nonviolence.” Her injuries, which you can see in this Democracy Now! 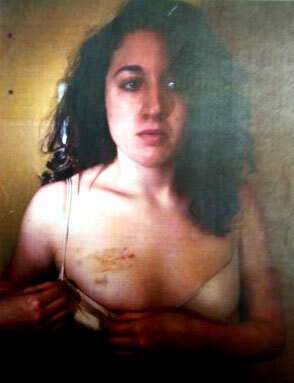 piece, are indisputable, particularly the hand-shaped bruise on her right breast. Meanwhile, The Guardian, which has covered McMillan’s case closely, reports that Bovell has twice been investigated by Internal Affairs, including for one incident in which he and his partner were alleged to have run down a 17-year-old on a dirt bike. He received a “command discipline” for failing to radio that they were in pursuit. In another case, he was filmed kicking a suspect on the floor of a Bronx bodega. (Unfortunately, the judge in McMillan’s case has ruled against turning Bovell’s internal disciplinary file over to the defense.) Austin Guest, a protester who was arrested the same day as McMillan, is currently suing him, claiming that Bovell purposefully bashed his head into the seats of a police bus as he was dragged down the aisle. We’ll keep you updated as the trial moves forward.